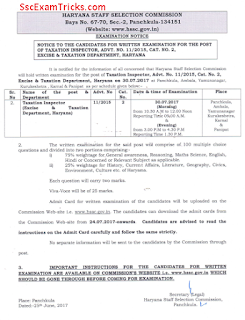 HSSC Excise Inspector Exam Result 2018 Advt. 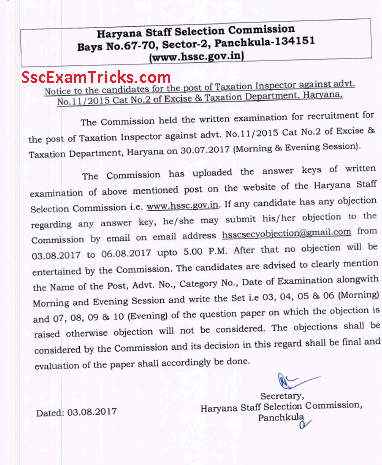 11/2015 Scrutiny of - HSSC Clerk / Welfare Organiser Interview Call Letter 2018 - HSSC Clerk Final Result 2017 Declared Now - HSSC Taxation Inspector Result/Answer Keys 2017 -HSSC Taxation Inspector Result/Answer Keys 2017 Released - Download Haryana 1074 Excise Inspector Interview Call Letter 2017 Result Date - hssc.gov.in Advt. 11/2015 Hall Ticket. Date of Document Verification: 23.08.2018. 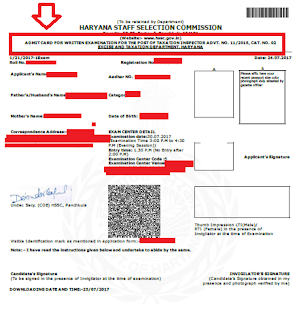 The latest news is that HSSC is under process of uploading online Admit card for Taxation Inspector exam which is expected to be held in April 2016 at many centres across Haryana state. It is noted that no admit card will be sent to the correspondence address of the eligible candidates and admit card will be available through online mode only. Remember that validity of the candidates will be assessed through printout of online admit card and photo ID proof of the candidates. 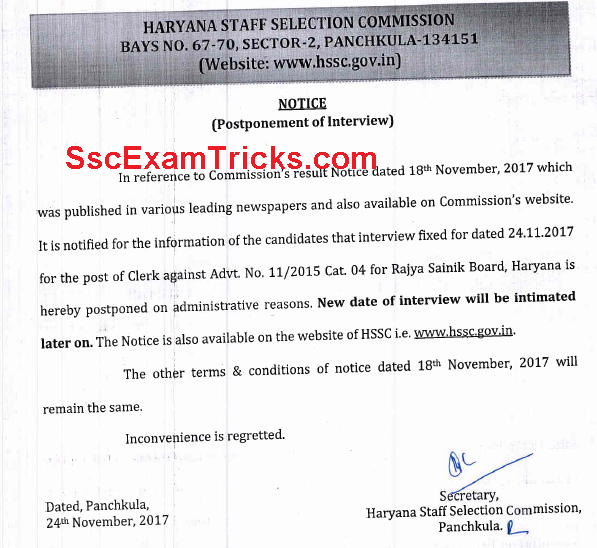 Latest News (18.11.2017) - Finally, HSSC has declared the result (interview) for the posts of Clerk and welfare organizer under Advt. No. 11/2015 Category no. 03 & 04 respectively. Earlier the written test was organized on 15th & 17th May 2017 and scrutiny of document was held on 28th August & 01st November 2017 for the posts of Clerk and Welfare Organizer. The twice of candidates have been called for interview. The marks secured by the candidates have been shortlisted for final selection of the candidates. The interview for the post of Clerk has been postponed to new dates which will be intimated soon. Earlier the interview has been scheduled to 24.11.2017. The postponement notice for Clerk can be downloaded here. Latest News - Recommended List for Junior Coach Table Tannis, Taekwondo, Weight Lifting, Kho-Kho & Tennis under Advt. No. 11/2015 cat. no. 34, 35, 36, 38 & 39 (respectively) along with its detailed result on www.hssc.gov.in. Latest News - Recommended List for Junior Coach Boxing, Cricket, Football, Juddo, Kayaking & Canoaning under Advt. No. 11/2015 cat. no. 27, 28, 30, 32 & 33 (respectively) along with its detailed result on www.hssc.gov.in. HSSC has declared the result of Junior Kabaddi Coach Result on official website. The list of candidates called for Junior Kabaddi Coach interview list has been uploaded now. Reporting time for Interview - 09.00 A.M.
Latest News (21.11.2017) - The result for HSSC field investigator under Advt. 11/2015 Cat. No. 09 has been available now. Those candidates who have appeared in the examination can download their result from the link given here. About twice of candidates are called for interview which has been scheduled on 25.11.2017. 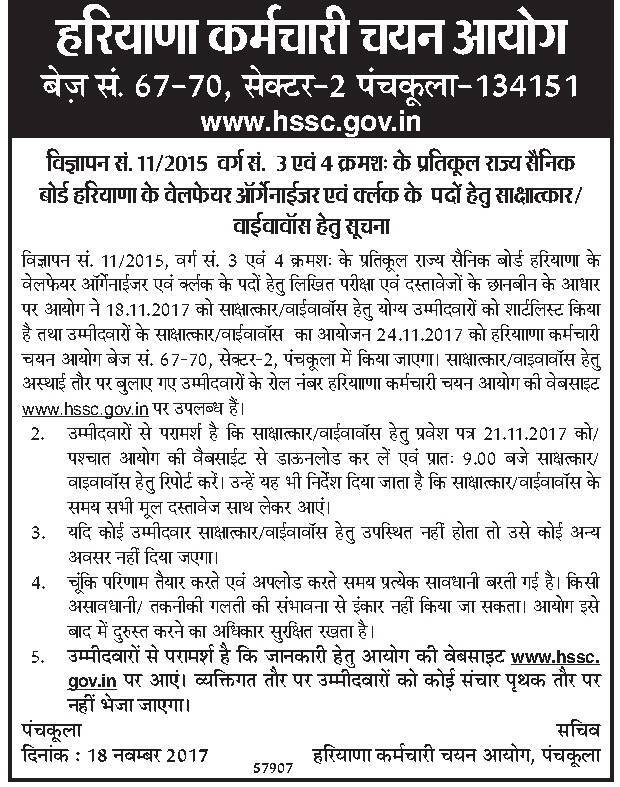 On/after 22.11.2017 and report at 09.00 A.M.
Latest News (21.11.2017) - The interview call letter for HSSC Clerk and Welfare Organiser will be available today on official website www.hssc.gov.in. These admit card may be available around 04:00pm. The candidates can download it from the link given here. The interview has been scheduled on 24.11.2017. The good news is that Haryana HSSC Taxation inspector answer keys has been available now for Morning & Evening Slots. The result is expected to be available around 45-60 days after the date of exam. This means that HSSC may declare result in September/ October 2017. 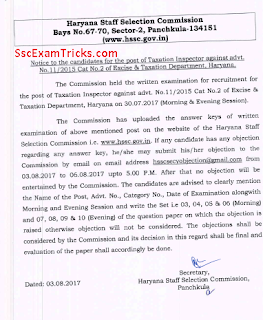 HSSC Taxation Inspector Answer Keys of Examination held on 30th August 2017 under Advt. no. 11/2015 cat no. 2 to be available within a week or ten days after the date of examination. These answer keys may be available around 09th to 12th August 2017 on official website. The good news is that HSSC has uploaded online admit card for examination to be held on 30th July 2017 for Taxation / Excise Officer. The problem/technical error has been solved by HSSC.....Thank you. Don't worry, don't be hesitate. Keep focusing on your preparations for Haryana Taxation/Excise inspector. The admit card may be delayed due to some technical error on the website. These call letters will be uploaded within 2-3 days. These admit card may be available around 26th-28th July 2017. 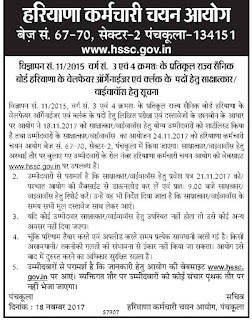 So don't get frustrate and over attempt for downloading HSSC Taxation/ Excise Inspector Admit card under advertisement 11/2015 category no. 2. However the pages show technical error, but it may ok in few attempt and show your admit card at the bottom of the homepage. The good news is that HSSC has announced the exam date and admit card uploading date for the posts of Excise and Taxation Inspector Category no. 2 under Advt. no. 11/2015 on official website. The exam has scheduled on 30th July 2017 and Admit card will be uploaded from 24th July 2017 onward. Haryana Staff Selection Commission (HSSC) is working on selecting best and eligible candidates suitable for 1074 vacant posts of Taxation Inspector, Excise Inspector, Welfare Organizer, Clerks, Driver, Tracer, Assistant Draftsman, Field Invigilator, Junior Engineer etc. 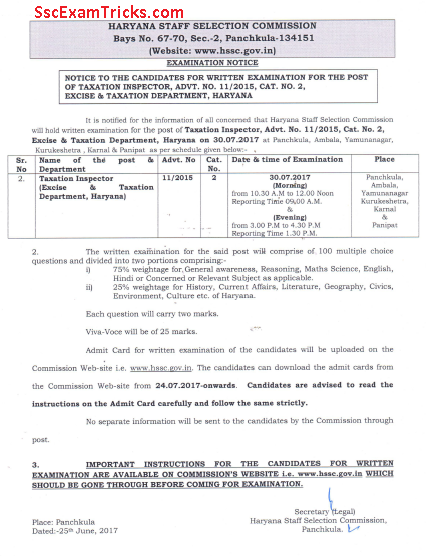 through official notification advertised on 01st December 2015 by the commission. The final selection of the candidates will be made by taking written test and interview of the eligible candidates. The written test date will be announced soon after the completion of online process to be filled by the interested candidates which is going to be ended on 17th February 2016. These successfully applied candidates who have paid and confirm their application fee are now waiting for HSSC Taxation Inspector Admit card 2017. Latest News (23.02.2016): The big news has been revealed as HSSC has uploaded a new notice in which the last date to apply online application has been extended to 29th February 2016 on the official website. The last date to pay application form has been shifted to 04th March 2016 (new date). 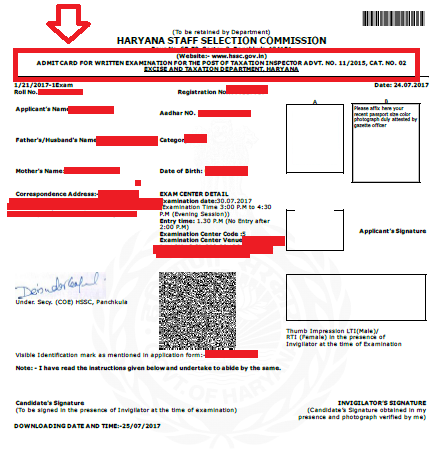 It was estimated that last date of HSSC online application form would be shifted to new date due to orthodox condition of the state (riot happened all over Haryana in which many government offices have been burnt and holiday have been announced by the Government from 17th to 22nd Feb 2016 and also, the internet facility of Rohtak, Jhajjar, Bhiwani and some other states have been stopped due to it). This page will update you as HSSC Taxation Inspector exam date gets published by the commission. The date, time and venue of examination was mentioned 30th July 2017 in the admit card of HSSC Taxation Inspector exam 2017. The final selection process will be completed in three stages; written test, interview & typing test. The written test was an objective type exam containing 100 MCQ paper held on OMR sheets for 200 marks and last 1 1/2 hours. The qualified candidates will be shortlisted for interview followed by typing test in which typing speed will be assessed as standard requirement as 30 wpm, 300 words. The interview call letter will be available after 3-4 days after the interview date. The online admit card for HSSC taxation inspector exam 2017 can be downloaded from direct link provided on this page. You are required to ensure registration number and date of birth (DOB) before downloading it. Enter these details carefully and click on the submit button provided in the end of the page. The HSSC Taxation Inspector Admit card 2017 will be downloaded on the screen. Note download date, time and venue of examination from this admit card. Plan your shortest route to reach venue of exam & ensure your photo ID proof to attend the examination. Don’t be late in the exam because late coming will not be entered into the examination hall.